One of Scotland’s first major build-to-rent developments on the banks of the Clyde has got the planning green light. 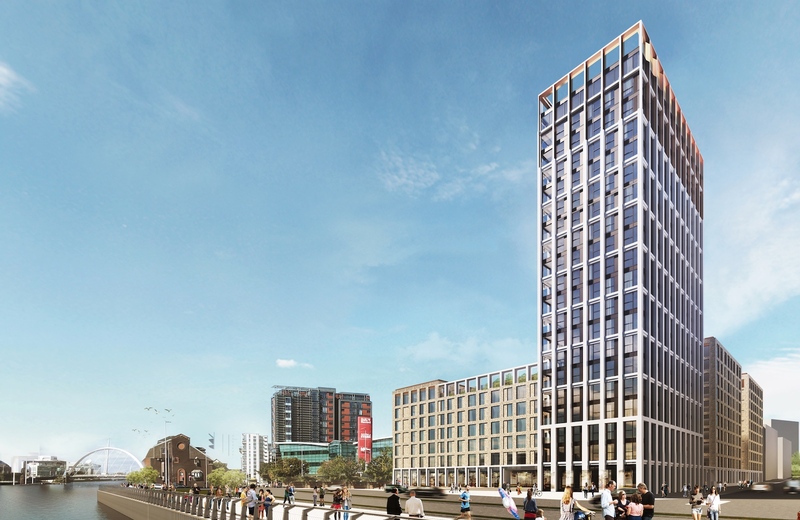 The high-rise 500-flat Glasgow Waterfront project at Central Quay is being led by PLATFORM_, a developer and operator of private rented housing. The £100m scheme will offer a mix of flats for rent, spread across four blocks ranging from six to 20-storeys in height. Rents will be priced to be affordable to more than 50 per cent of workers locally. Designed by Glasgow-based architects Keppie, the development forms part of a wider masterplan at the Clydeside Central Quay area, which includes 300,000 sq ft of office space and a 150-room hotel as well as new housing. The build-to-rent sector is expanding rapidly, with nearly 140,000 build-to-rent homes either completed, under construction, or in planning. Matt Willcock, development director at PLATFORM_, said: “The next phase of the project will begin early this year, starting with appointing contractors with a view to having spades in the ground by the third quarter of 2019. Stuart Patrick, chief executive of Glasgow Chamber of Commerce, said: “A development of this scale is a real boost for the Broomielaw, bringing 500 new homes to an area perfectly situated between the city centre and West End.